Integral to human existence is the concept of ‘journey’: our physical journey through time and space, our experiential journey through life, our metaphysical journey from nascent self-awareness to the clumsy beginnings of self-knowledge and onwards, towards identity and self-belief. In these paintings of limitless internal and external space, Edwards invites us on a journey through atmospheric landscapes and shifting emotional terrains in the company of our own, unique cargo of neuroses and memories. 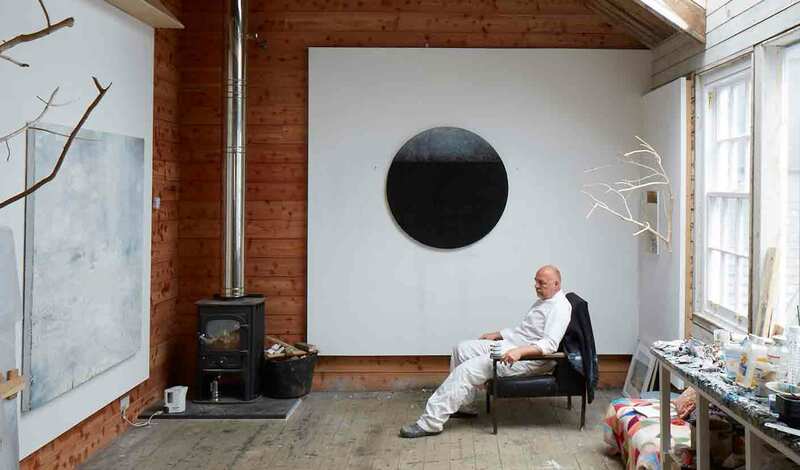 Ciphers of wilderness landscapes, such as coniferous forests, ravines, Fjords, tundra and the wide Atlantic Ocean which surrounds his studio, act as metaphors for psychological spaces yet to be explored. Exhibiting from 10th June to 1st July 2017. 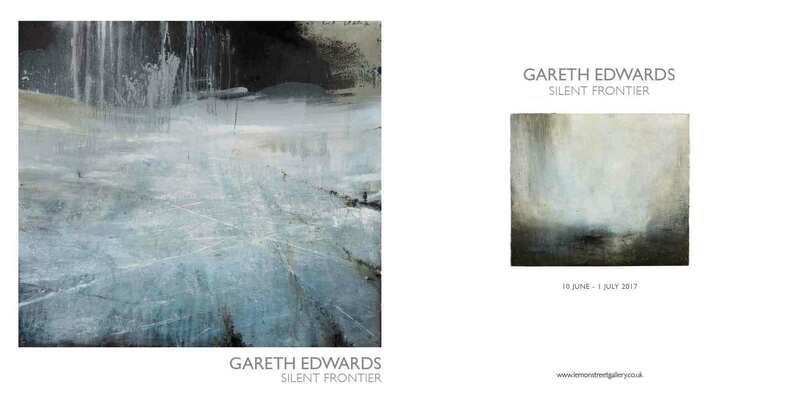 Purchase the Silent Frontier exhibition publication for £15 including p&p (£17 worldwide). The materiality of these works, the applications of paint, ash, oxides and wide plains of fluid colour, act as signposts, guiding the viewer through open fields of contemplation and recognition: they are works filled with poetic and phenomenological intent. At the silent frontier of frame and canvas, Edwards opens up a doorway to something deeper than a material understanding of our own existence, a doorway to somewhere as strange and distant as it is familiar and tangibly near: beneath our feet stretches a fragile landscape of ice, while above our heads, pure white precipitation falls against a black sun; meandering rivers of glittering brilliance trace lines of hope through the dark forests that lie before us all; flat, misty morning light encircles us on a blissfully still ocean of quiet colour. In each work, the ever-present horizon, sometimes seen and sometimes felt, calls us forward. These theoretical journeys, precious and private in their way, are accompanied by allusions to specific journeys, in titles which refer, amongst others, to Titus Oates’ great sacrifice, a moment of extraordinary humanity which, we all hope in respectful remembrance, might reflect our extraordinary selves. Similarly, large canvas,es of indefinite destination are accompanied by twelve small, sumptuous and certain paintings of British Sea Light, executed in a short but incredibly intense moment of engagement with the open ocean. 2000 ‘Running with Butterflies: New paintings’, Hart South West. 2006 20/21 British Art Fair, London. 2006 NSA selected by Nicholas Usherwood, Campden Gallery, Glos. 2004 Four paintings at the Autumn Open Exhibition, RWA, Bristol. 2003 Summer show, Hart Gallery, London. 2003 Curated ‘ I.D.’ Show for NSA at Newlyn Art Gallery. 2003 I.D. show at Newlyn Art Gallery, Cornwall.